What are the main concepts of Alternative Beta? How can we identify the return contributors from Alternative Beta and the ones from Alpha? What are the benefits and the risks for the investors? How can Alt-β contribute to enhanced risk adjusted returns? How can we practically incorporate Alt-β in a diversified strategy to enhance risk adjusted returns? How can we add Alpha within an Alt-β approach? We aim to address these important questions in this whitepaper. At SystematicEdge, our objective is to generate compelling risk adjusted returns for our investors while preserving capital, and in our experience, incorporating the Alternative Beta approach in our systematic investment process is accretive to the other return drivers in our investment strategy and greatly enhances the portfolio’s risk adjusted return profile. We spoke about this subject in more detail during a joint presentation with two quantitative finance professors, Serge Darolles and Guillaume Monarcha, from the University of Paris Dauphine, both at the forefront of research in this field. This paper is based on that presentation. However, as we begin, let’s review the concepts of Alt-β from a high-level point of view. 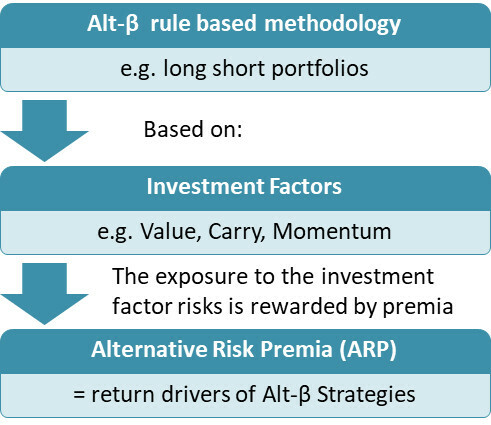 Alt-β are investment methodologies producing systematic positive returns over the long term. They are rule based methodologies based on “Investment Factors” and the resulting risk payoffs are called Alternative Risk Premia (ARP). Goal: harvest the ‘risk premia‘ from the factors it is based on. Smart Beta is the base of ‘factor investing’ or ‘style investing’. Portfolio implementation using accretive tools and techniques to add value and optimise all aspects of the investment process and compressing costs at all levels (use the techniques applied in Investment Banks and Hedge Funds). The academic research has already identified more than 400 ARPs. There are many methods to screen and grade assets with respect to the metrics’ variables. Using the Alt-β approach within an investment process allows the portfolio-manager to assess and grade assets using the best practice well-grounded in academic research. From one asset-manager to another the definition of value can be different, the estimation of the risk premia and their associated risk adjusted returns can be very different. Yet there is a consensus regarding the fundamental, price and risk parameters to use, well documented in academic research and by practitioners. How can we identify the return contributors: Alternative beta or Alpha? Alpha measures the managers’ talent and its edges. The average alpha of a large pool of managers is relatively stable over time. The total portfolio return drivers = Alpha premia + Alternative Risk Premia + Market Risk Premia. Research has shown that true Alpha generated by hedge funds is relatively stable over time (3% to 5%). Yet hedge funds have delivered relatively low performance in the past 5 years (0 to 5% in the 90% percentile). The Alpha component is still present in the total returns but those returns have been reduced due to negative contributors such as market risk, overcrowded strategies and the fact that Risk Premia are cyclical. Risk premia are ‘strategic’ return drivers and their realization of positive returns don’t necessarily materialise in the short term. One example can be seen in hedge funds’ long short relative premium which does not only comprise alpha, it also has systematic return contributors such as market beta (around 50%: see graph top right), systematic long-short ARP (e.g. value) and other intended or unintended ARPs. True Alpha is the residual (stripped of systematic sources of returns), and it can be positive or negative. One of the biggest commercial successes of the decade for the asset management industry (see graph below for an illustration of growth in AUM in MUSD since 2008). About a third of the institutional investors and family offices invest in systematic factor based strategies. 80% of big investors with more than 5 Billion USD in AUM are using systematic factor based strategies. Almost all of the above investors are exploring using systematic factor based strategies or increasing the systematic AUM. The AUM in systematic diversified strategies such as Alt-β, is continuously increasing while the AUM in discretionary strategies is decreasing. What are the Alt-β benefits for the investors? Performance: by definition ARPs are identified, documented and understood systematic sources of returns, both by academic research and industry practitioners. Diversification of risk types across asset classes: lowers the correlation to the main market and broadens the return sources which subsequently can substantially improve a portfolio’s risk adjusted returns. Transparency and clarity: a straight forward systematic, rule based strategy, the possibility to set a return objective within a risk budget, framed by a set of investment factors, styles and a defined risk mandate. Return granularity: identify what the investor is paying for. The portfolio manager’s ‘talent’ risk premia is called Alpha. True Alpha must be stripped from the return’s contributors that are not based on talent and edges but that are coming from systematic risk premia. Costs and capital efficiency: because Alt-β‘s investment universe only comprises liquid assets with a risk budget typically inferior to the main market risks, capital consumption is reduced. That is why asset owners under regulatory constraints such as insurance companies keep on increasing their AUM in Alt-β strategies. In the graph below, we consider the growth of a typical 50% Equity/50% Bonds portfolio over 16 years. If we incorporate in the portfolio a basket of diversified ARPs (e.g. based on Value, Carry, Quality factors) we enhance the portfolio’s risk adjusted profile. This example shows the value added by the ARPs (increase of returns) and their diversifying power (decrease of the portfolio’s volatility). Subsequently, it enhances the Sharpe ratio and even reduces drawdowns. What are the Alt-β risks for the investors? This phrase from Riccardo Rebonato (quantitative researcher) highlights the fact that a portfolio with only ARPs may be volatile with relatively low returns. Let’s consider, as an example, the famous USD/JPY carry trade where one borrows in JPY (the low yielding currency), converts the JPY in USD, and invests in a USD asset (e.g. deposit). At this time, this strategy can yield up to 2.5% per annum (which is the differential of short term interest rates between USD and JPY). It means that the monthly returns would be a bit less than 0.25%. Yet the USD/JPY may move 5% to 7% in one month, so quite stormy moves for gentle returns. However, at SystematicEdge, we find that integrating ARPs to a diversified strategy within a risk management framework produces more robust and controllable risk adjusted returns than a strategy only comprising ARPs in the academic sense. Volatility & drawdown risk: market dislocation, e.g. 2008, induced drawdown in Alt-β strategies (i.e. need to add Risk Management). ARPs cyclicality: each ARP produces positive returns over time in a specific economic or technical context. Risk factor overcrowding: large identical positions compress risk premia (e.g. commodity carry, long / short equity). Implementation risk: the ARPs contributions could be lost in translation: implementing ARPs is a technical challenge, the devil is in the detail. Unintended risk production must be controlled. Lack of live track record for some ARPs: New ARPs are found every month. Track records must be established before industrial use. How can we practically incorporate ARPs in a diversified strategy to enhance risk adjusted returns? The SystematicEdge example: At SystematicEdge, our investment philosophy is: We invest in ‘Quality’ assets that have a compelling ‘Value’ and recurring ‘Carry’ potential. The ‘factor equilibrium’: We experienced that finding a factor combination that makes economic sense, improves the stability of returns over time. For instance, the combination of our three factors means that while we are collecting income (i.e. carry) from the assets, we favour a sustainable (e.g. quality) compelling valuation. Also when the asset valuation decreases (e.g. bonds or equity shares sell off), a part of the value is transferred into carry (e.g. lower bond price means higher yield). We avoid antinomic factors (e.g. value combined with momentum) as this combination may lead to an unstable portfolio behaviour and has little economic meaning. Yet we acknowledge the decorrelation among antinomic factors that can contribute to overall diversification. The implementation of the Alt-β approach is a challenge for the Asset Manager. It is due to the fact that the asset manager‘s investment process implementation is guided and constrained by the investors’ demands, needs, and regulatory requirements. The implementation is also guided by the known benefits and characteristics of the ARPs, the financial expertise and technological resources available. Challenging replication (e.g. convertible arbitrage, mean reversion). Behaviour difficult to explain to the investors in standard economic terms as this is an allocation of several risk premia that translates into a portfolio of many types of long and short assets. Integrate ARPs as a component of a diversified strategy: (e.g. the SystematicEdge multi-asset-class strategy) In our opinion it is a more compelling proposition as it has higher performance potential and may include systematic, yet dynamic risk management. Straight forward ‘asset’ allocation implementation (rather than an allocation of risk premia). Choice of the investment philosophy and its translation into investment factor terms (e.g. Value, Carry, Momentum). Design the process to capture the ARPs (choice of assets, financial instruments). Implement the Risk Management process and ‘Hedging Strategy’ in order that the portfolio’s overall risks remain within the pre-defined risk budget. Avoid extreme loss to preserve the compounding effect. Fintech gives us the tools enabling the Portfolio Manager to harvest broader return sources based on a large amount of data. The alpha resides in how to apply this technology to achieve the investment goals. Big Data analysis to collect continuously numeric and non-numeric data such as market sentiments from news and social networks that are relevant and accretive to the whole investment process. This allows the rule based investment process parameters to be fed by live data and adapt continuously to market cycles and market regimes. Machine Learning to refine the systematic asset screening and grading from fundamental and quantitative metrics as well as improve the already automated (by algorithm) trade execution in the market. In Conclusion, Alt-β strategies produce, by construction, positive long term strategic returns with low correlation to the main market. For further academic research on this, please see Paris Dauphine’s Professor Serge Darolle’s research regarding the persistence of the performance of the ARPs. When integrated to a diversified allocation (e.g. SytematicEdge multi-asset-class), it can both contribute to higher returns and lower volatility. The use of the Alt-β approach allows the granular identification of the investment factors driving the returns and can subsequently systematise many investment philosophies and approaches along with a clear risk adjusted return objective with a defined risk budget. This approach, based on liquid assets, allows for cost compression, technology integration and automation at all levels of the investment process. We highlighted the importance of the many ‘Alpha contributors’ implemented thanks to the portfolio managers experience and talent that add value such as the process design to capture ARPs, the portfolio construction, the Risk Management process, and the use of efficient accretive ‘smart technology’ (Big Data, Machine Learning). 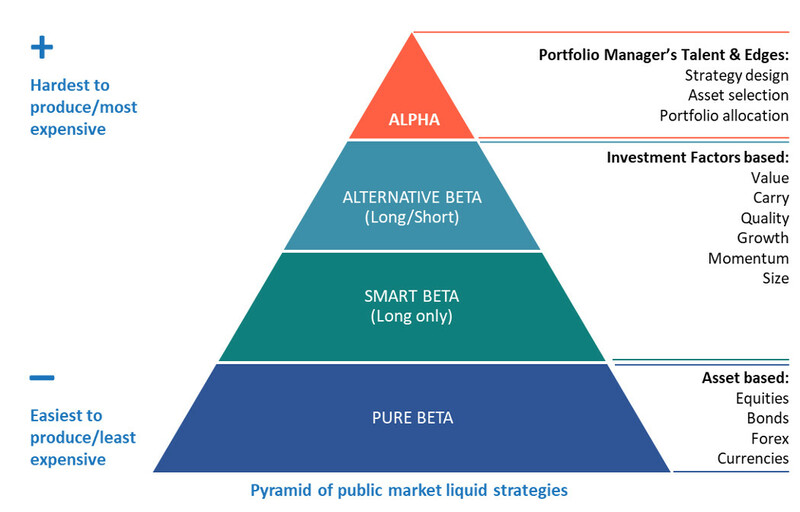 The Alt-β approach can be applied in a standalone ‘pure ARP’ strategy or integrated in a diversified strategy such as SystematicEdge’s multi-asset-class proposition. We experienced that incorporating the Alt-β approach to our investment process, combined with technology and our experience, produced a robust systematic investment strategy that delivered compelling and recurring risk adjusted performance since its inception. Alain Groshens has been directly in charge of multi-asset portfolio management and head of trading divisions for major European Investment Banks (Societe Generale, Commerzbank & Natixis), accountable for generating returns and managing risks for the past 25 years. As Global Head of trading Alain was in charge of 50 traders across the globe, managing multi-asset portfolios totaling up to 30 billion euros of notional. Alain spent most of his career in Asia and was based in Paris, London, Tokyo and Hong Kong. Alain holds a Master’s Degree in Financial Markets and a Master’s Degree in Computer Science from Paris Dauphine University and a Bachelor’s Degree in Maths & Physics from Pierre & Marie Curie University in Paris. SystematicEdge is an Investment Solutions firm that specialises in systematic, multi-asset class portfolio management. Through the unique combination of our proprietary strategy (GMI), methodology (Alt-B2G) and portfolio implementation techniques, SystematicEdge has been able to deliver its objective of double digit annualised returns with single digit volatility while preserving capital. The investment universe is Multi-Asset-Class: Liquid world indices and benchmarks across asset-classes, regions and sectors. 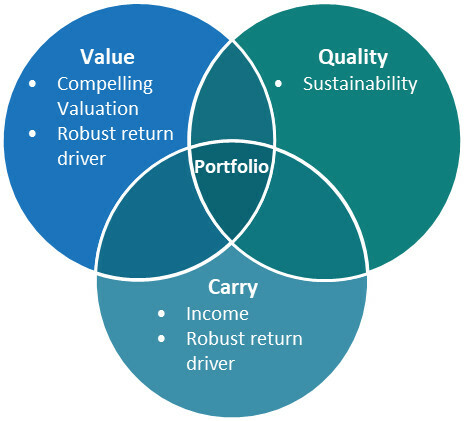 We use a Systematic Investment Approach based on 3 fundamental investment factors: Value, Quality and Carry. The process continuously adapts to changing market regimes and is supervised by expert portfolio managers. We also offer bespoke solutions for institutional investors. For more information please visit www.systematicedge.com. All SFC regulated activity is conducted by Privium Fund Management Limited, Suite 12, Level 5, Champion Tower, 3 Garden Road, Central, Hong Kong, SFC License No. BGR298.